Springfield Asylum Gil Deal Panel. 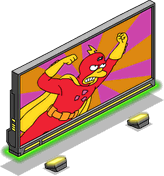 Radioactive Man Movie Set Gil Deal Panel. "Superheroes never die, they just wait til their reboot. Coming soon to an app store near you: the Superhero sequel you didn't know you wanted but will still wait through the credits to see!" 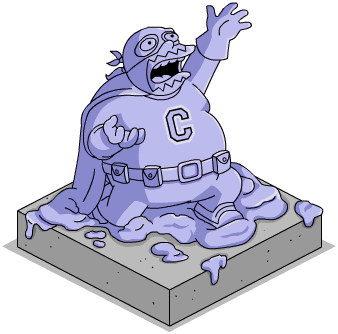 "Heroes return to Springfield to fight evil (while gyros return to Springfield to fight a lack of tzatziki sauce). But when a plot is revealed that threatens the entire town, heroes and villains are forced to team up to save it! 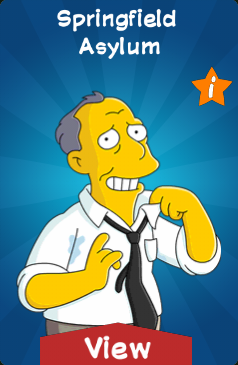 Join iconic Simpsons characters and their alter-egos as they battle against a greater evil. With new characters, buildings, decorations, and more... including a new battle system. 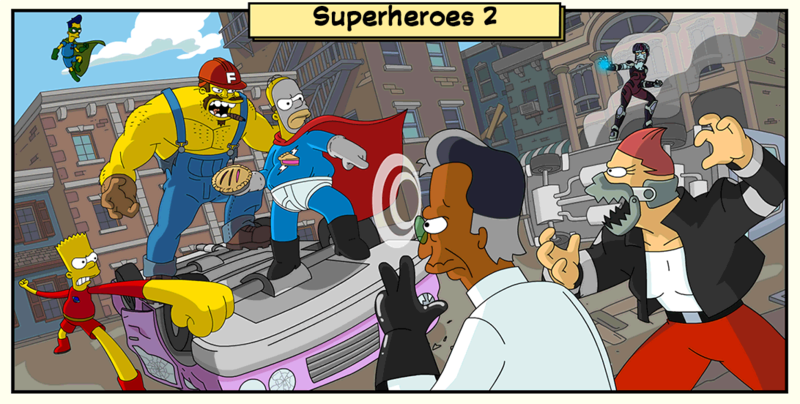 Can you unite villains and heroes to save the town!?" ―Event Description on the Kindle Pre-release. 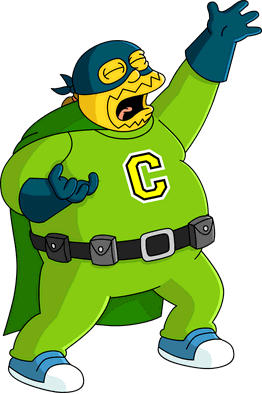 "Heroes return to Springfield – no not the sandwiches, the crime fighters – to fight a growing tide of criminals! 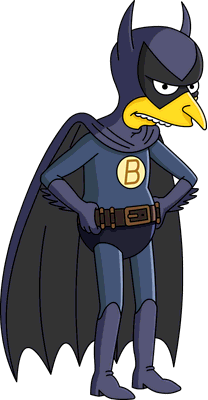 But when someone's evil plot threatens the entire town, old enemies will need to join together to save Springfield! 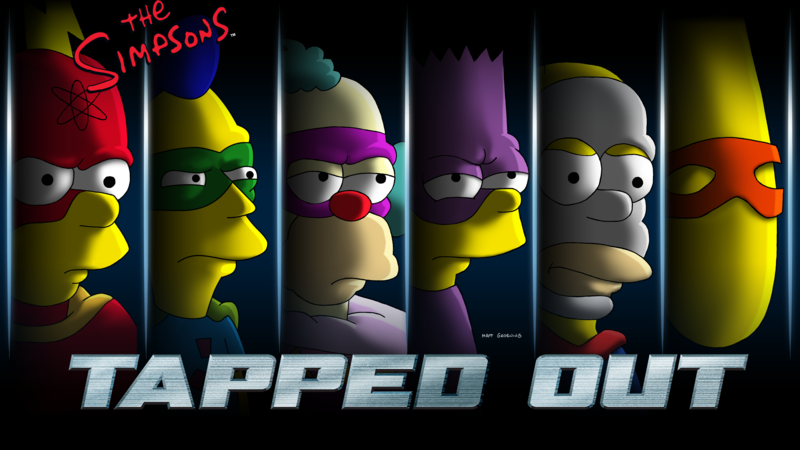 Join iconic Simpsons characters and their alter-egos as they fight together against a greater evil. 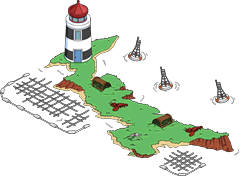 With new characters, buildings, decorations, and more... including a new battle system. 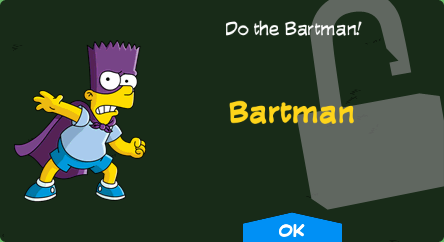 Can you unite villains and heroes to save the town!?" 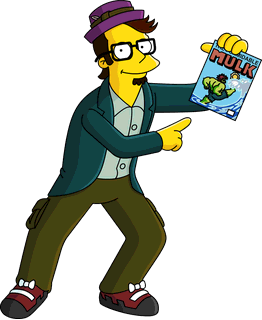 The Simpsons: Tapped Out Superheroes 2 content update was released on June 14, 2016 and was the one hundred and twentyninth content update. It was teased in the Wild West event Takedown app store update and on the game's Facebook page June 11, 2016. Its Store update was released by mistake on Kindle on June 8. 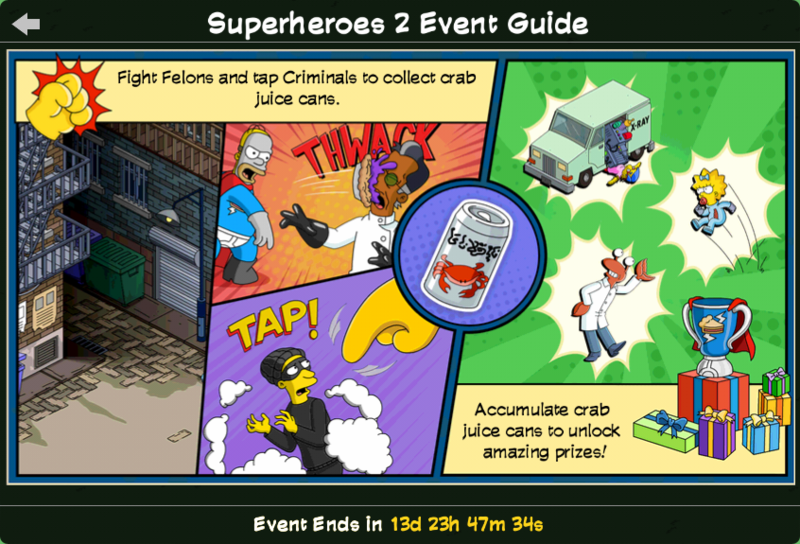 Its the second Superheroes event after 2015's. 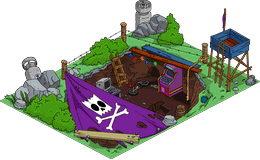 It added 8 new characters, 4 new character skins, 16 new buildings and 36 new decorations. 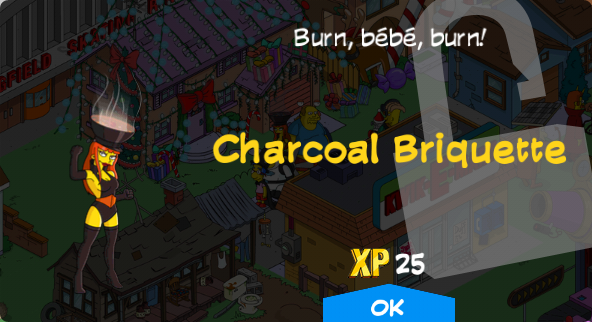 Charcoal Briquette Unlocks with France Flag. 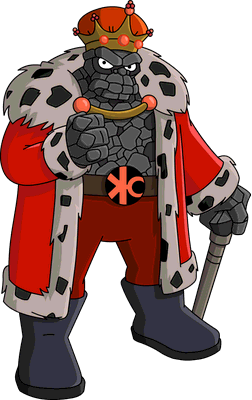 Old King Coal 52,950 Issue 1 prize. 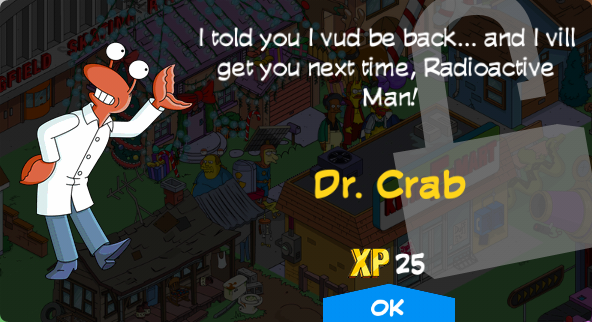 Dr. Crab 103,600 Issue 3 prize. 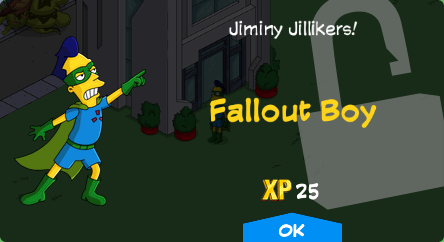 Fallout Boy Returns from Superheroes. Unlocks with Superior Squad HQ. The Collider 100 Returns from Superheroes. 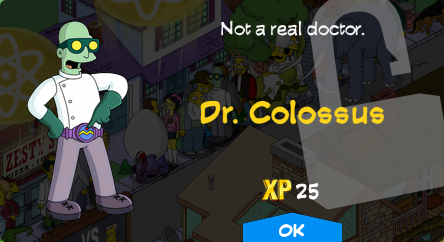 Dr. Colossus Returns from Superheroes. 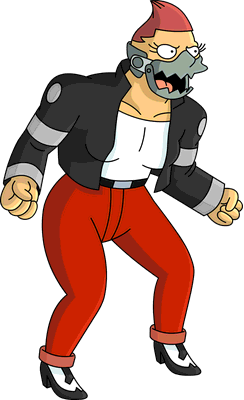 Petroleus Rex Returns from Superheroes. 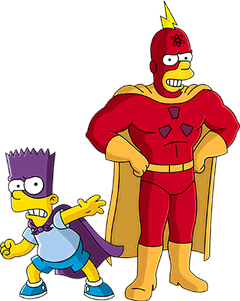 Radioactive Man 60 Returns from Superheroes. Bouncing Battle Baby 45,000 Issue 3 prize. 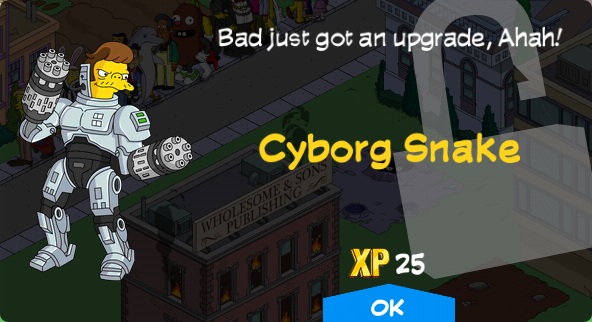 Cyborg Snake 33,400 Issue 1 prize. Clobber Girl 12,950 Issue 2 prize. 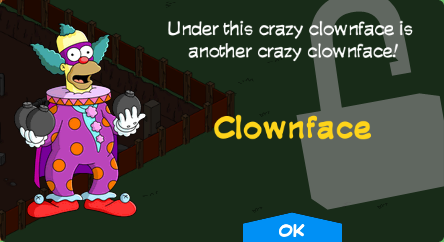 Clownface FREE Returns from Superheroes. 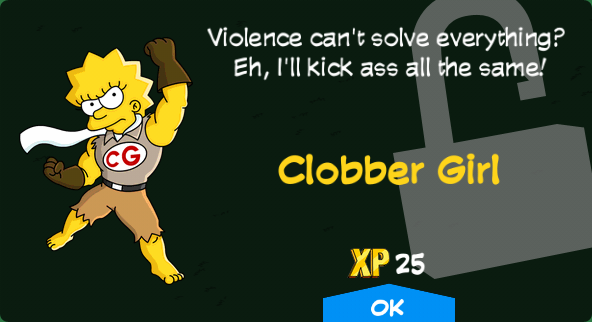 Unlocks after starting Who's the Boss Now? Pt. 1. 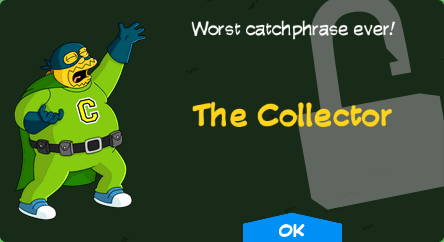 The Collector Returns from Superheroes. Unlocks after starting Inch by Inch Pt. 1. 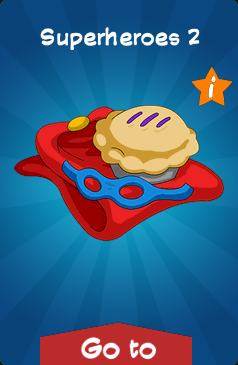 Pie Man Returns from Superheroes. Unlocks after starting Prelude Pt. 2. 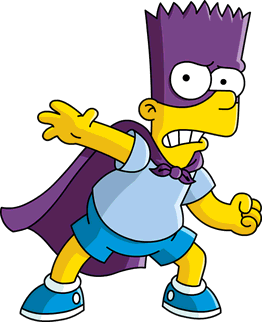 Bartman 60 Returns from Superheroes. Fruit-Bat-Man 90 Returns from "Dark Knight Court" episode tie-in and Superheroes. 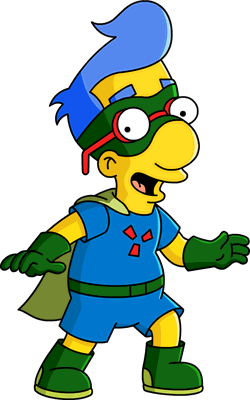 Sidekick Milhouse Unlocked with Radioactive Man Movie Set. Returns from Valentine's Day 2015 and Superheroes. Testost-Irene FREE Unlocked after starting Releasing the Pressure. 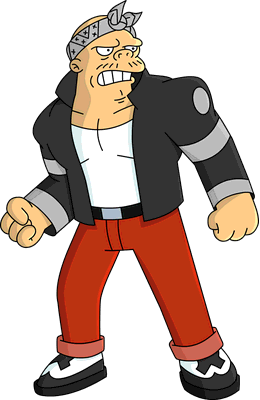 Tungsten Dude 3 Social Battle Prize. Orphan Alley FREE 6s Sheltering Felons Unlocks after starting Orphan Alley Pt. 1. Generates 3 Felon groups every 4 hours. Soilant Red Factory Making a Brand Out of a Bad Product Unlocks after starting Claw & Order Pt. 1. 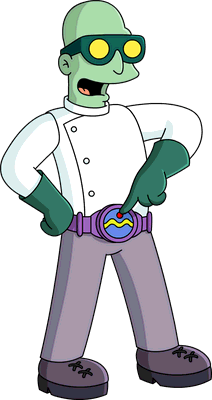 Dead Lobster Disguising Crab Meat as Lobster Unlocks after starting The Dead Lobster. Burns' Summer Mansion Rotting Since the 50's Unlocks after starting Inch by Inch Pt. 1. Spirograph Factory 61,900 4h Making Lame Math Art Since 1908 Issue 3 prize. One Week Wonder Films 77 4h Seeking the Next Big Summer Movie Social Battle prize. 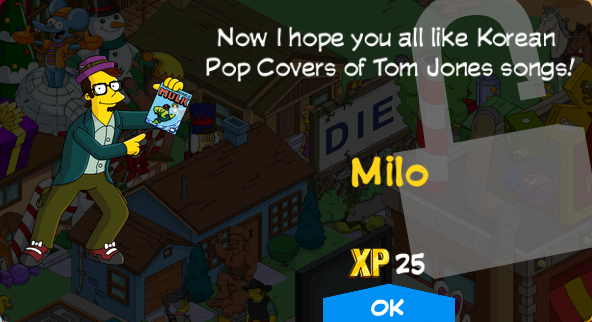 Coolsville 150 6s Providing Respectful Service Unlocks Milo. Generates 20 every 8 hours. 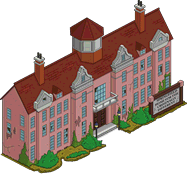 Springfield Asylum 200 Guaranteeing a 150% Escape Rate Generates 1 Felon group, each member has 5 hearts, every 4 hours. 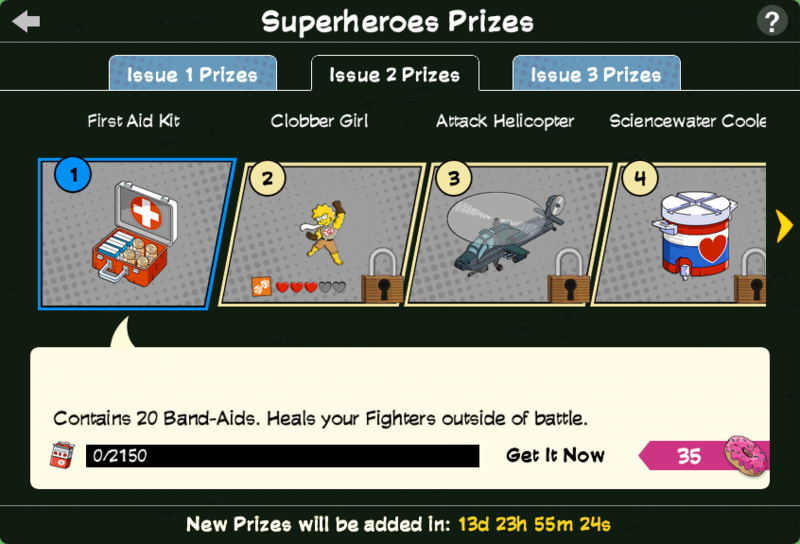 Dr. Lenny's Lab 78,800 4h Being Good at Torturing Superheroes Issue 3 prize. 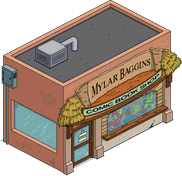 Mylar Baggins 11,500 Gambling it All on the Store Front Issue 1 prize. Zenith City Condo 960 Income Tax Issue 2 craftable. 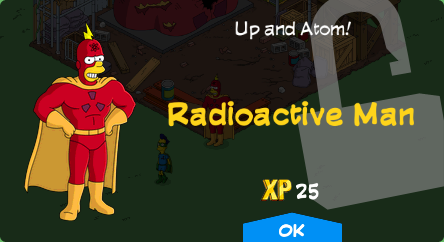 Radioactive Man Movie Set 150 6s Costing $1 Million per Shot Unlocks Sidekick Milhouse. Mansion West Wing FREE Unlocks after completing Inch by Inch Pt. 3. 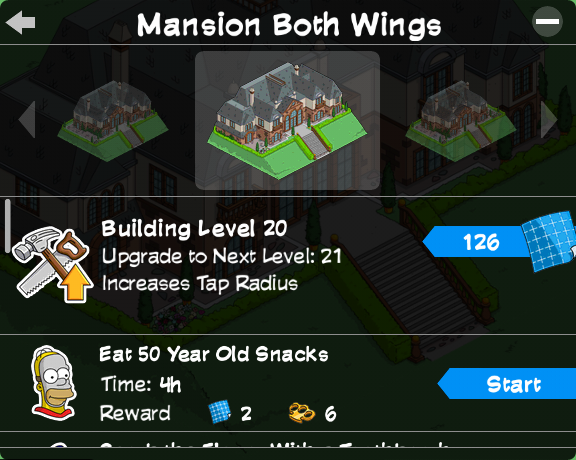 Mansion Both Wings Unlocks after completing Inch by Inch Pt. 5. Superior Squad HQ FREE 4h Fighting Crime Returns from Superheroes. Crap Silo 100 6s Producing Methane Returns from Superheroes. Tar Pits 175 Preserving Dinosaur DNA Returns from Superheroes. Kane Manor 55 Fumigating Bat Infestation Returns from Superheroes. Death Mountain 60 Hatching Implausible Schemes Returns from Superheroes. Beach House 120 Ignoring The Threat Of Coastal Erosion Returns from Superheroes. Zenith City Times 960 4h Being A Dying Medium Returns from Superheroes. Zenith City Store Front 945 Income Tax Returns from Superheroes. Botanical Garden 945 Boring School Children Returns from Superheroes. Alien 19,000 Issue 1 prize. 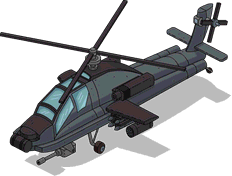 Attack Helicopter 22,300 Issue 2 prize. 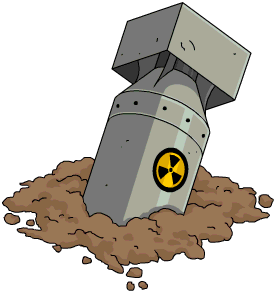 Atomic Bomb 170 Issue 3 craftable. 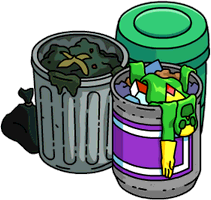 Garbage Can Issue 3 craftable. The Collector Lucite Statue 785 Issue 1 craftable. Kiosk 12 Social Battle prize. Lucite Container 325 Issue 1 craftable. Painted Horse 790 Issue 3 craftable. Plastic Prison 50,350 Issue 2 prize. Zenith City Billboard 335 Issue 2 craftable. X-Ray Machine 41,000 Issue 2 prize. 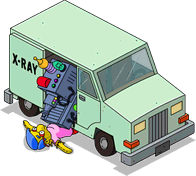 X-Ray Truck 16,850 Issue 3 prize. 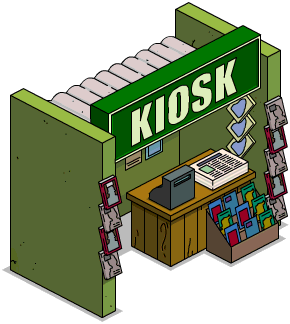 Generates 170 (Issue 1)/200 (Issue 2)/290 (Issue 3) Event Currency every 4h. Giant Snake in a Tree 835 Issue 2 craftable. 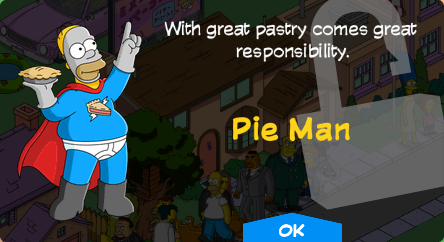 Pie Man Epic Statue 44 Social Battle prize. The Collector's Car 965 Issue 1 craftable. 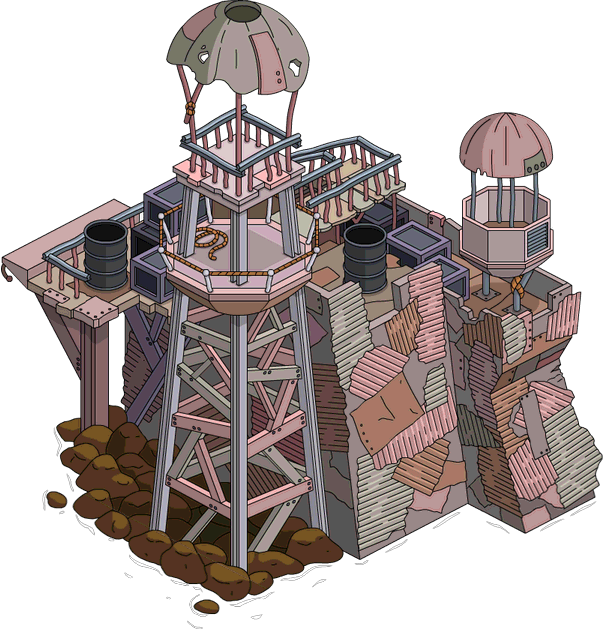 Aqua World Main Guard Tower 41,450 Issue 1 prize. Aqua World Wharf 2,415 Issue 2 craftable. Wrongly shown in the crafting menu as the same as the premium Aqua World Fishing Platform. Zenith City Phone Booth 50,000 Returns from Superheroes. Fruit-Bat-Signal 5,000 Returns from "Dark Knight Court" episode tie-in and Superheroes. 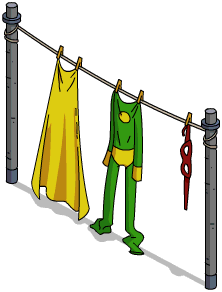 Super Jeb 25 Returns from Superheroes. France Flag 4,000 Returns from Tap Ball and Soccer Cup 2015. 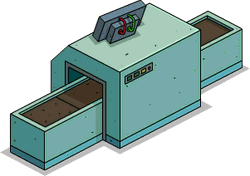 X-Ray Machine, The Collector's Car Treehouse of Horror X - "Desperately Xeeking Xena"
Aqua World Wharf is wrongly shown in the menu as the same as the premium Aqua World Fishing Platform. All jobs are 4 hour long. 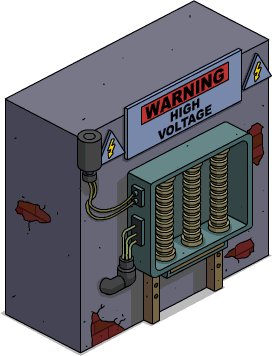 Each level requires 6xLevel. 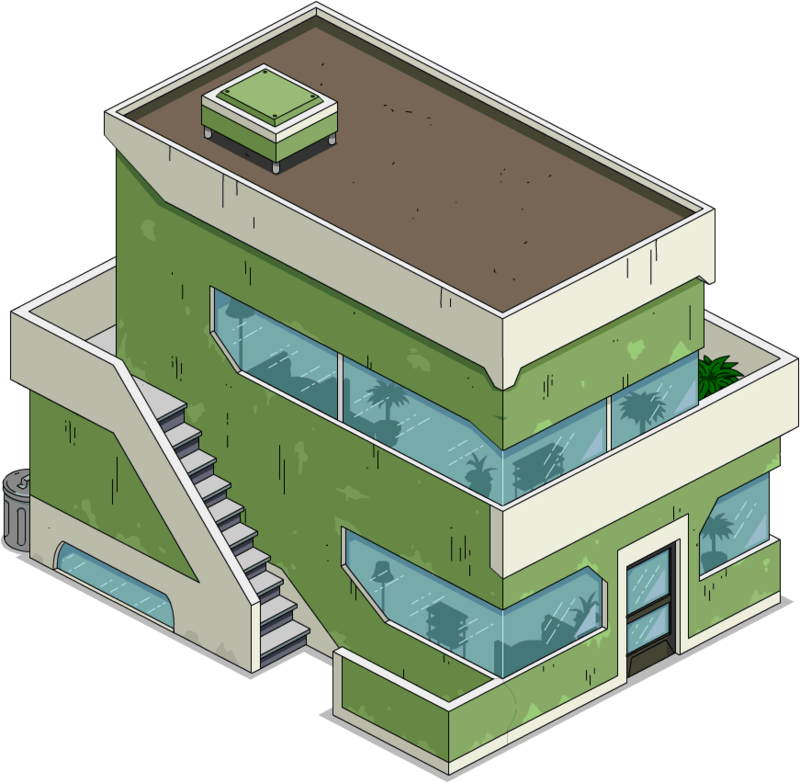 Level 5 unlocks the West Wing and 15 unlocks the East Wing. All levels increases the Tap Radius on Felons. 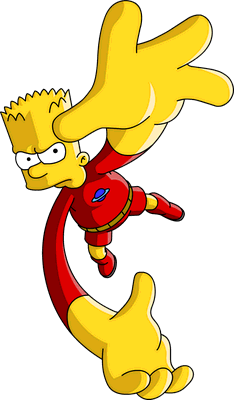 You fight sending your superheroes in and having them battle your enemies. 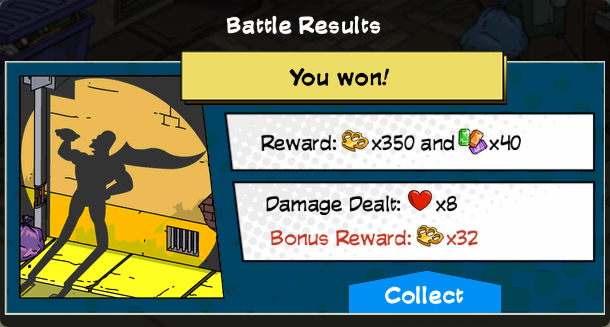 If you win you get more resources, and the more damage you do the more you receive too. You get some even if you lose. 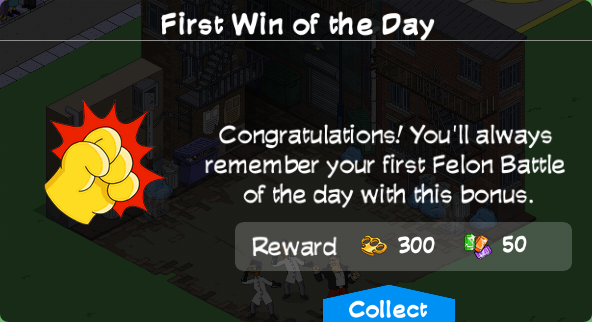 On the first win of the day you get additional rewards. 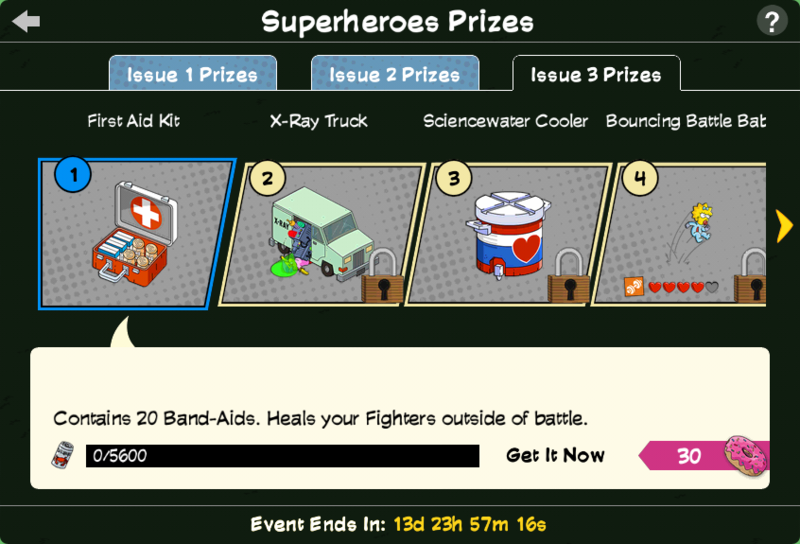 Issue 3: 600 Event Currency and 120. The fighting system, similar to Pokémon, consists in a Rock, Paper and Scissors battle. Brain wins against Tech, Tech wins against Muscles, Muscles wins agains Brain. Normal effect (same type characters) will do 1 heart of damage. Supereffective will deal 2 hearts of damage. To change the character on the field, press the switch button, but remember, the enemy will get one attack on you that way. 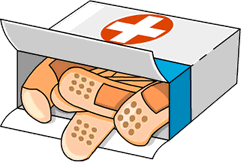 After the battle your fighters will be hurt and need healing. 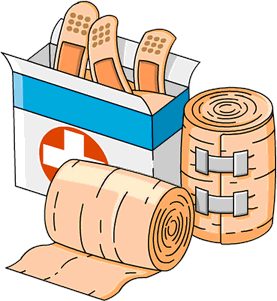 By crafting Band aid kits you can replenish their hearts outside of battle, to get them ready to rumble once again. If you don't have enough materials, the fighters will regain health in time. 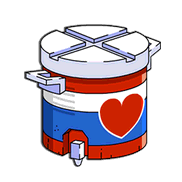 If you need to replenish hearts in battle you can also use the Sciencewater. 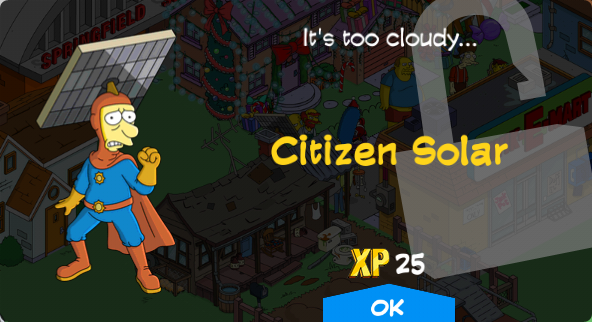 You can get it by tapping criminals or buy one for 2 donuts when you don't have enough. 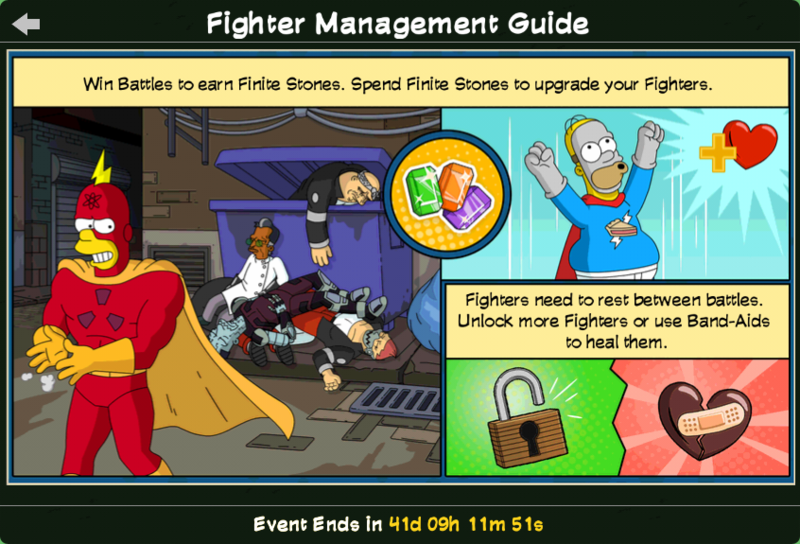 To power up your partners you can use the Finite Stones obtained from the battles. You can power them up to get one more heart every time till the max of 5. Upgrading once costs 245, then 380 and finally 550. 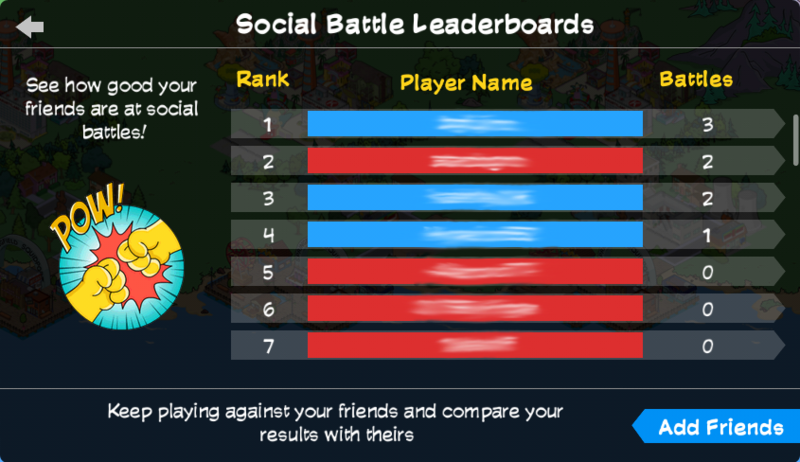 Social battles are important too: you need to do a lot of fights against your friends to earn all the social prizes! Defeating them or losing to them doesn't matter for the prize (it still matters the same way as normal battles for rewards though) but it's really important you battle every day! The final prize requires 115 battles, and every day you can only do 3 battles total against your friends! That means 39 days of battles! 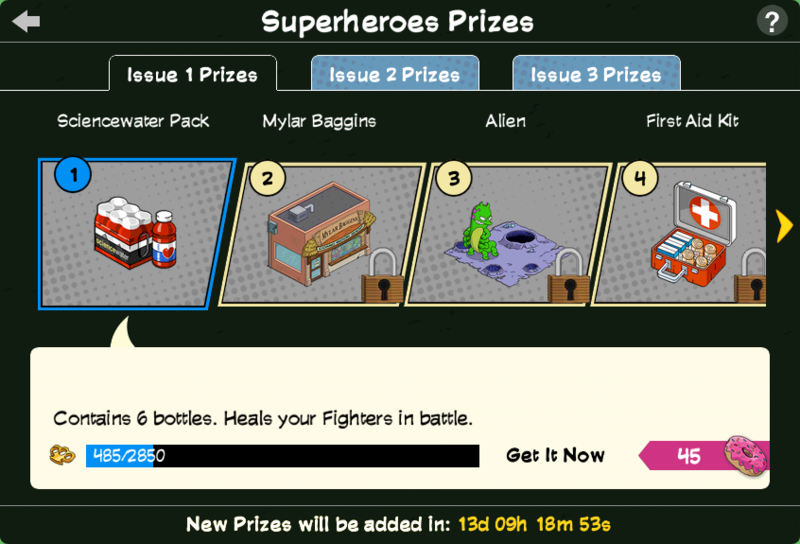 To battle your friends click on the top right fist icon. If the friend doesn't have that icon, it means your friend hasn't updated to the event yet. 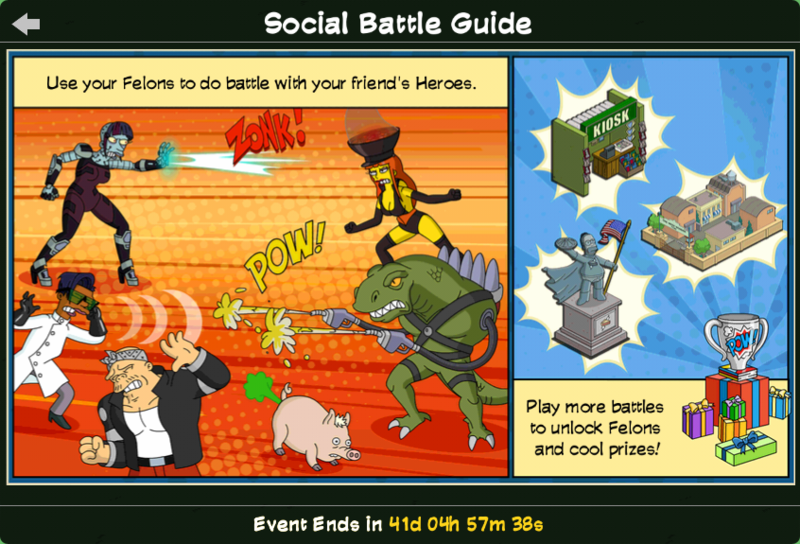 In social battles you'll use felons themself, you can unlock more by fighting against your friends in the prizes. You can heal them the same way as your own characters. Note: DO NOT retreat from from a fight in a friend town, it'll count as one of the fights but won't receive a point for the social prizes. 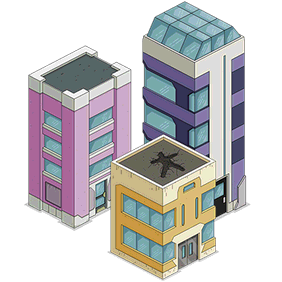 Felons spawn in your town every 4 hours by tapping the Orphan Alley. The maximum number of groups you can have at the same time is 12. 3 Social Battles can be fought every 24 hours. The timer starts after the first social battle of the day ends. You can check your and your friend's results in the Event Leaderboard. The red part means a loss, the blue part means a win. The bigger an area is the more the user has won/lost. 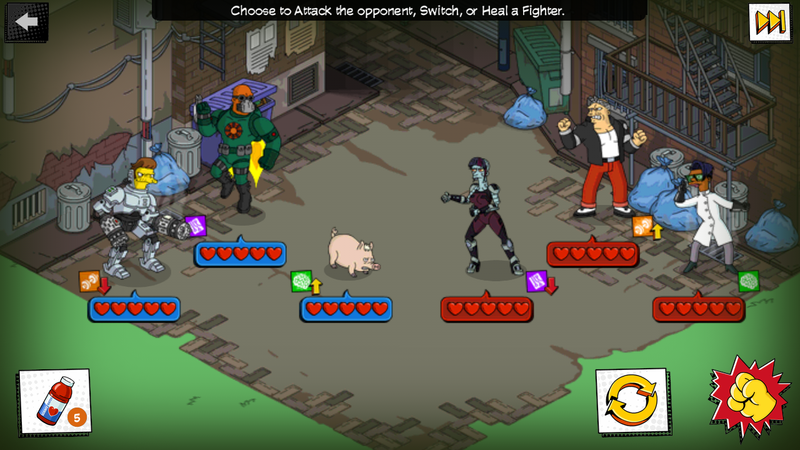 Quick Battles: On June 30th, Quick Battles were introduced, adding a new button on the battle field on the top right. Clicking it, you can speed up the battle and do nothing. However, there's no heal or switch, it all happens as if you'd tap the bottom right button to fight without any other action. To preserve health and deal more damage, control the team manually. Felons. Max life level is fixed. 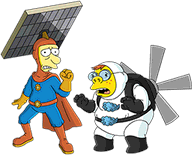 A new character group has been added, Sequel Squad: Bart, Homer, Lisa, Mr. Burns, Krusty, Comic Book Guy, Snake, Maggie, Radioactive Man, Fallout Boy, Plopper, The Collider, Dr. Colossus, Petroleus Rex, The Fracker, The Scout Master, Citizen Solar, Charcoal Briquette, Wind Lad, Old King Coal and Dr. Crab. 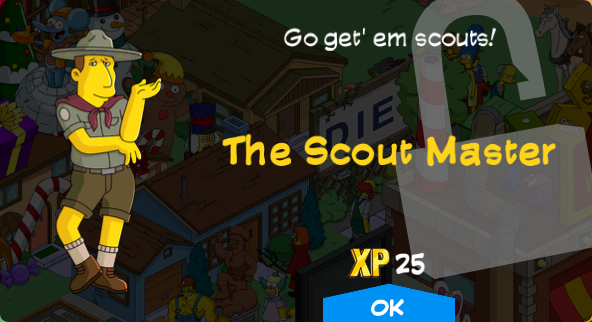 Sideshow Bob won't spawn while a battle is active. The app icon, splash screen, friend visit icon, task book and ambience music were changed to new ones for the event. Nature items, text boxes and text were changed to their comic looks. 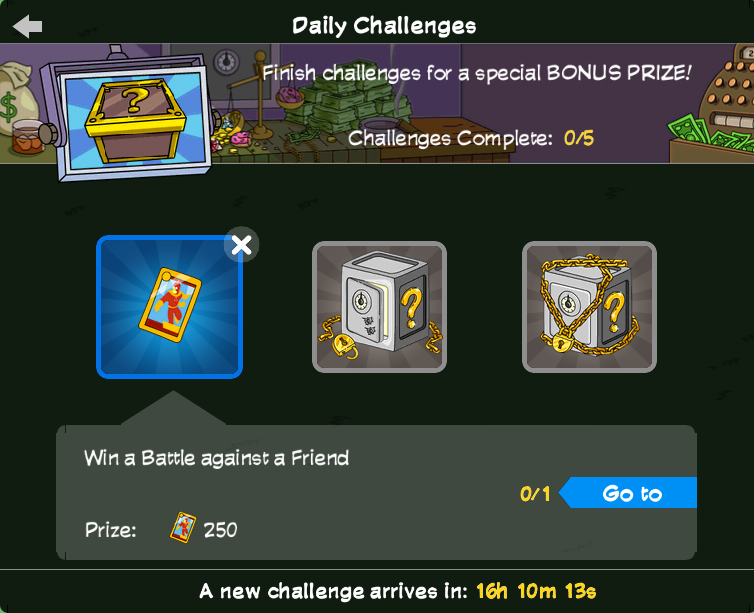 Daily Challenges were added for the event. 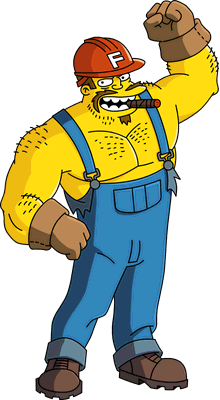 Homer's Drink Beer with Intensity and Recruit an Elite Chili Team jobs now requires Homer's Chiliad event to be active. A new row of land was added. Completing The End of the Beginning Pt. 22 no longer shows Winter 2015's Act 3 Completed message. 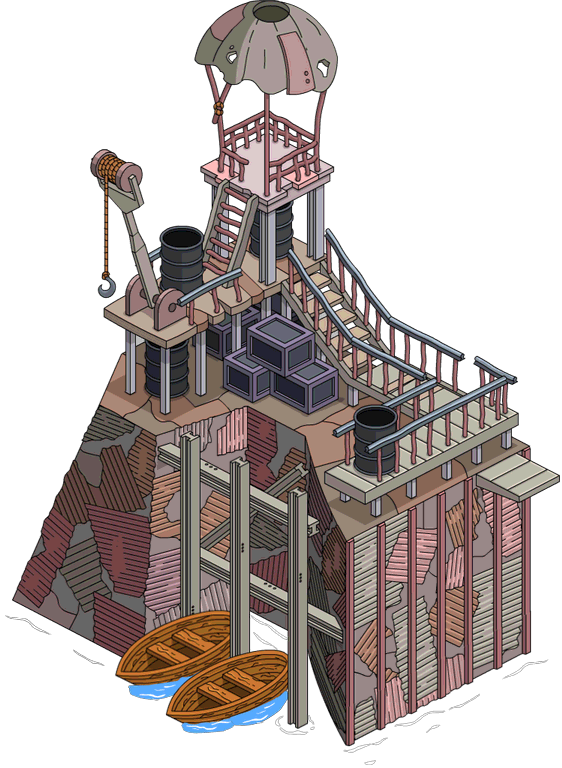 Building Kane Manor now takes 6 seconds instead of 8 hours and yields 55 instead of 10 and its task is now premium. 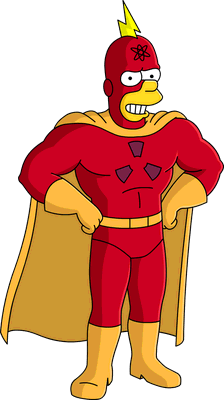 Radioactive Man, Dr. Colossus and The Collider's jobs are now premium. Building Burns State Prison now takes 6 seconds instead of 8 hours and yields 90 instead of 10 and its task is now premium. 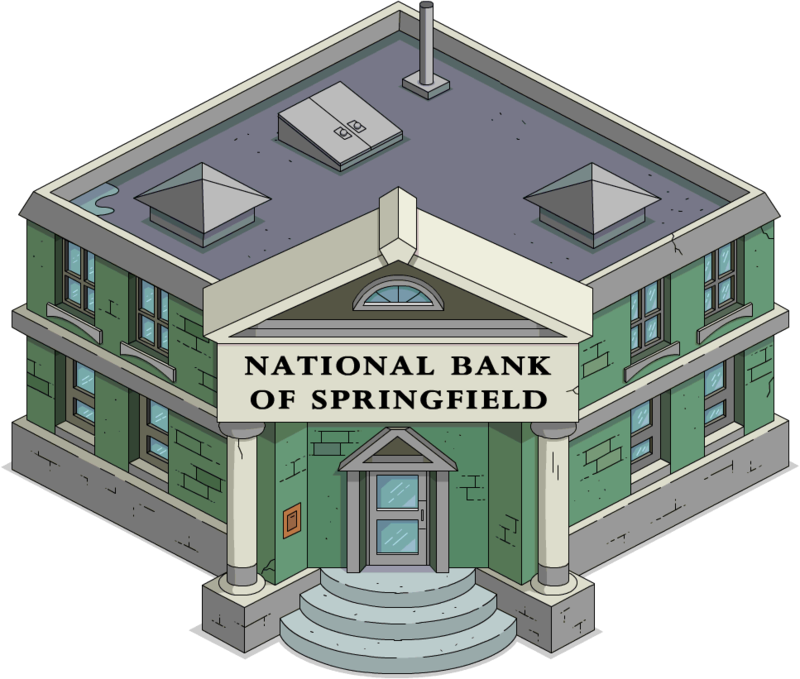 Building National Bank of Springfield now takes 6 seconds instead of 8 hours and yields 80 instead of 10 and its task is now premium. Building Death Mountain now takes 6 seconds instead of 8 hours and yields 120 instead of 10 and its task is now premium. 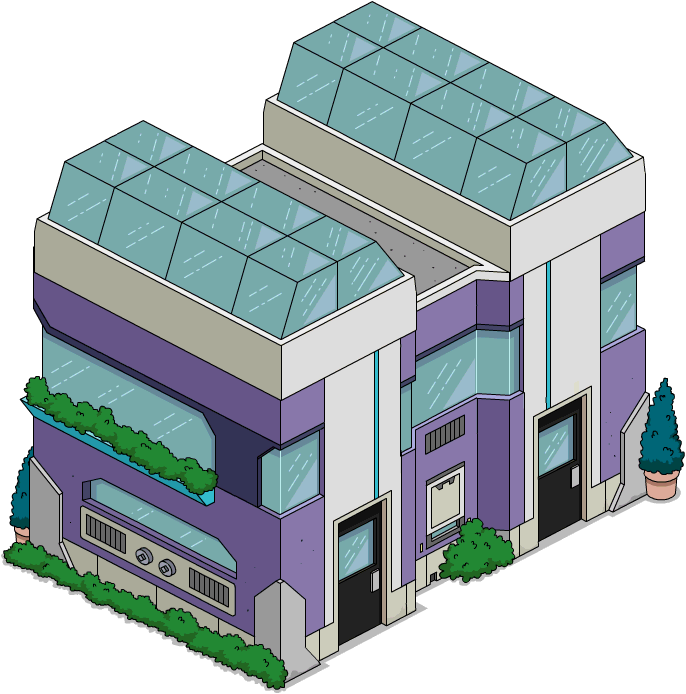 Zenith City Store Front was changed from the group Homes to Shops. 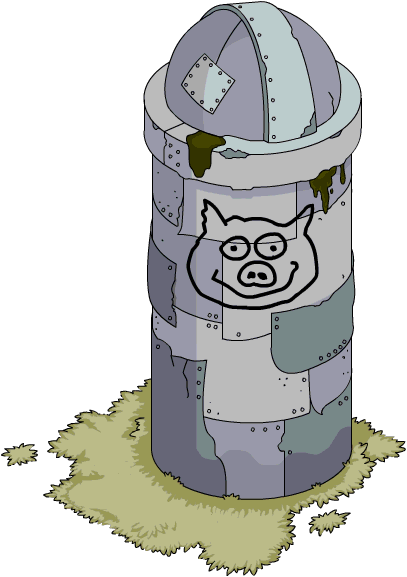 Crap Silo's task is now premium. Building Tar Pits now yields 80 instead of 10 and its task is now premium. 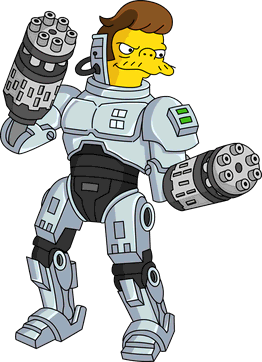 Petroleus Rex's job Terrorize Springfield now requires A Stalk to Remember Pt. 2 or Jurassic Spark Pt. 2 to be started. Petroleus Rex's job Do Research now requires A Stalk to Remember Pt. 3 or Jurassic Spark Pt. 3 to be started. 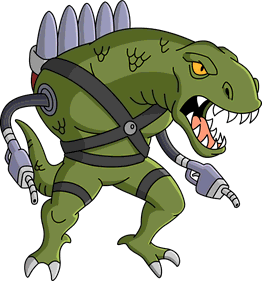 Petroleus Rex was moved from Super Villains character group to the Fossil Fuel Four character group. Re-entering the inventory puts you back at where you left off rather than starting you back at the beginning. Placing Zenith City Phone Booth now yields 5,000. 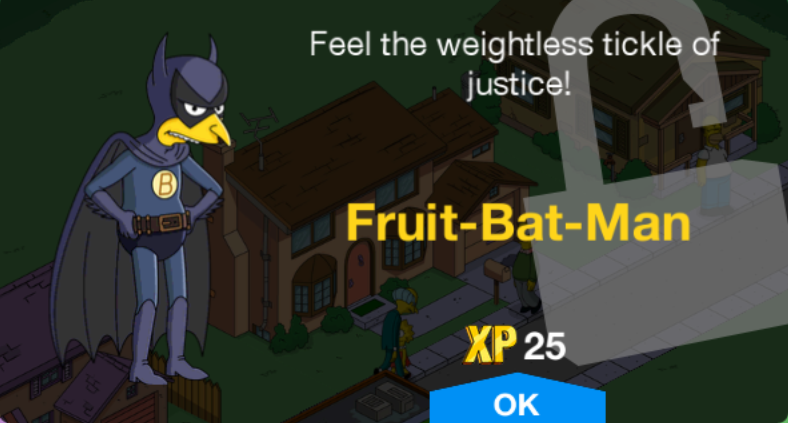 Placing Super Jeb now yields 25, yields a bonus of 0.6% and 200 Vanity points instead of 50. 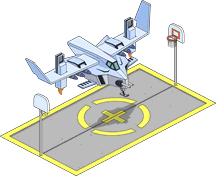 Placing Radstation Air Fortress now yields 225 instead of 250. Placing Rad Mobile now yields 10,000 and 50 Vanity points instead of 10 Obedience points. 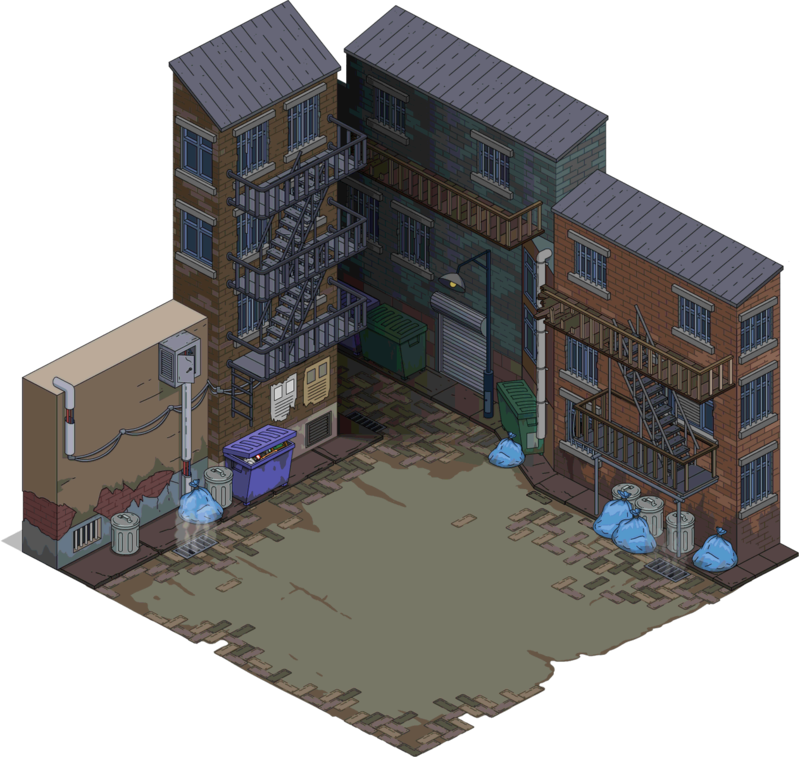 The town center was changed to Orphan Alley. 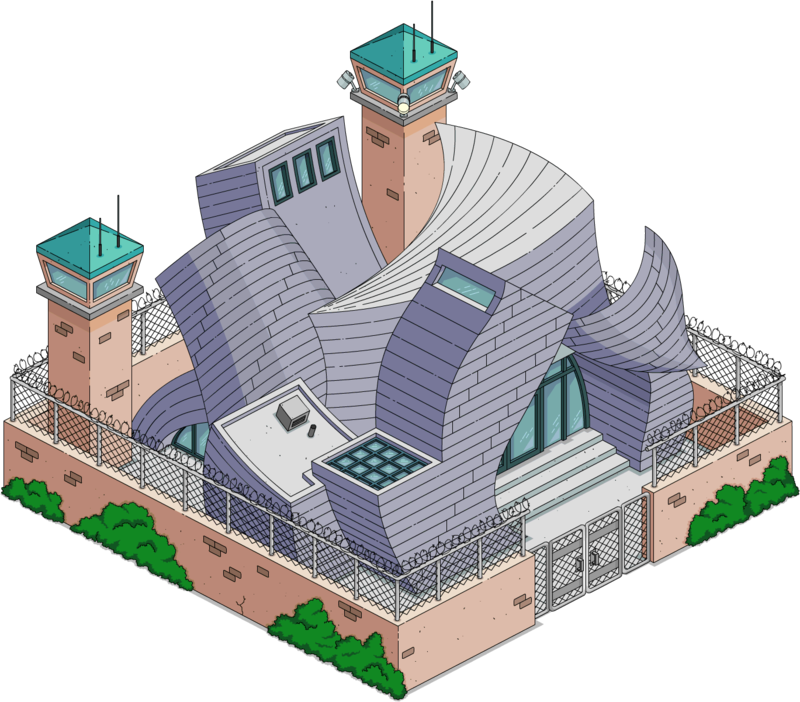 Bart's Treehouse, main Krusty Burger, Android's Dungeon, Cooling Towers, Springfield Penitentiary and main Kwik-E-Mart can't be stored and sold. 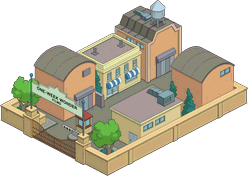 Crook and Ladder's Moe's Tavern burning sound was added. 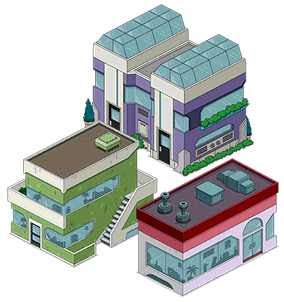 Characters can now be sent to special buildings like Open Air Stage, Town Plaza, etc. 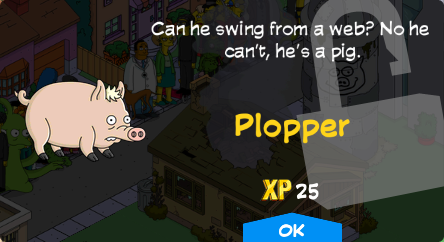 and still be sent on other tasks too due to a glitch. 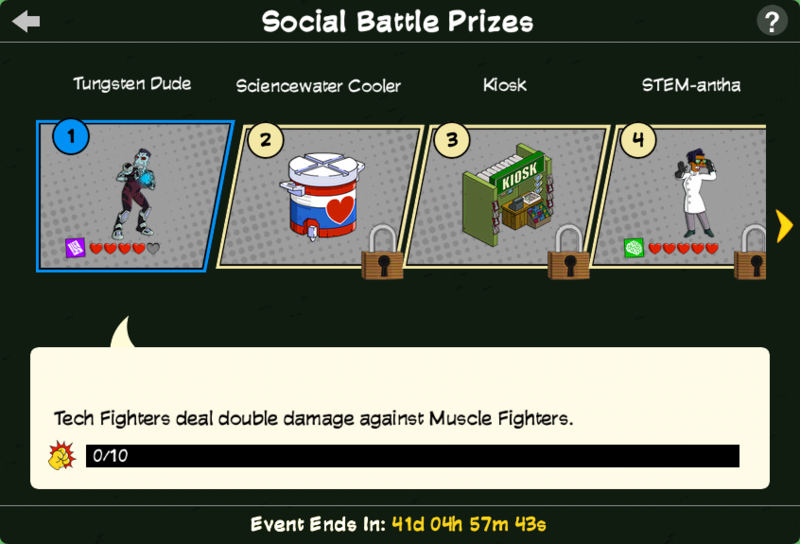 If a user retreats from a fight in a friend town, it'll count as one of the fights but won't receive a point for the social battle prizes. Fixed a glitch with social fights not resetting at the right time. Many dual character jobs' ending and friend button press reload is fixed, speeding them up. A bug in upgrading Private Island was fixed. 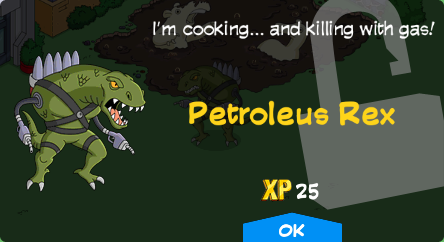 Petroleus Rex's image in the store has changed to show Tar Pits and the hearts icon. Large Band-Aid Box now costs 180 instead of 210. 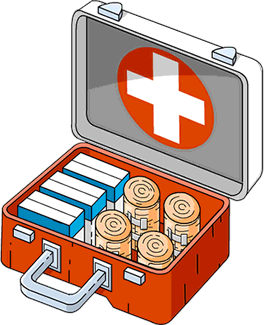 First Aid Kit now costs 340 instead of 420 or 425. 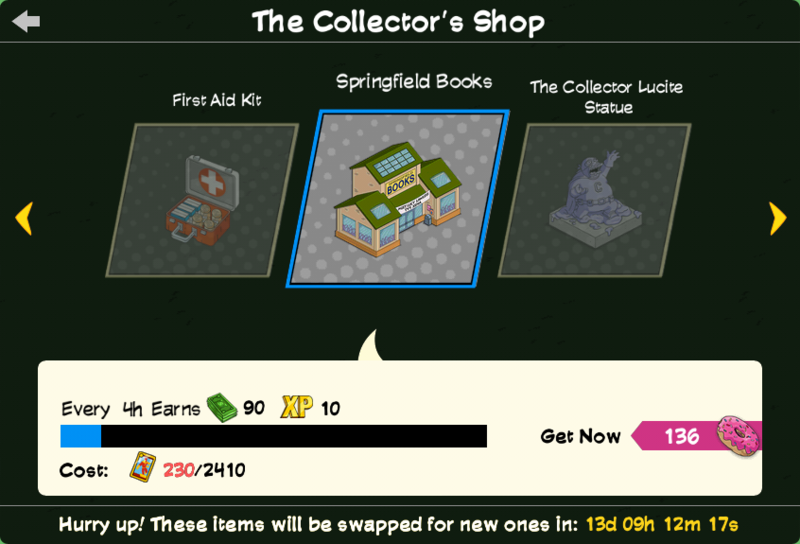 In the Bastille Day system message, The Collector's Store, wrongly named, was changed to The Collector's Shop. 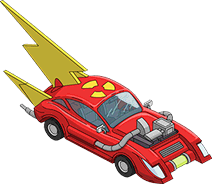 Platinum Scratch-R are set to appear again from 6/28 to 7/5 and from 7/20 to 7/27. 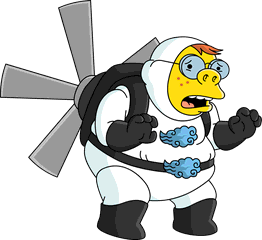 Space Coyote and Homer's Bite Homer's Leg's tap on the characters was fixed from incorrectly moving to Rex Banner to moving to Space Coyote. 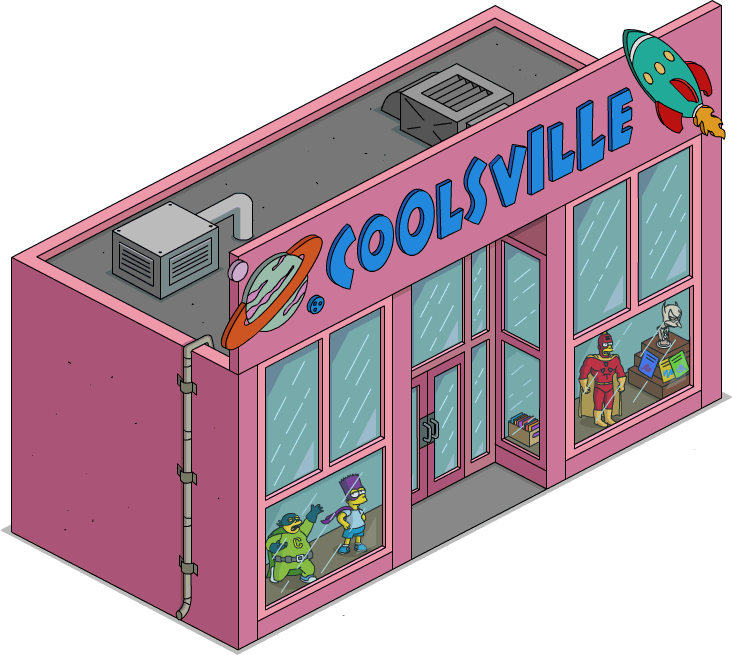 A bug that got characters stuck in Krustyland was fixed. Placing Dirt now requires Slack-Jawed Yokel Pt. 2 to be completed. Superheroes 2 One Panel store text was changed from black to white. 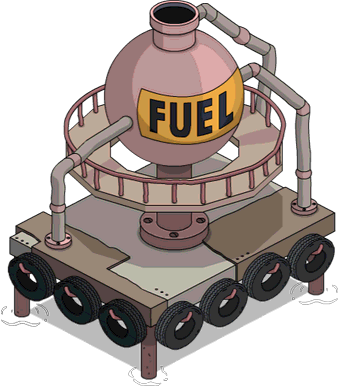 An animation was added to Aqua World Fuel Tank and Plastic Prison. Fixed a glitch not rewarding Social Battles on Daily Challenges. The tooltip "Upgrade Felons to make them stronger!" 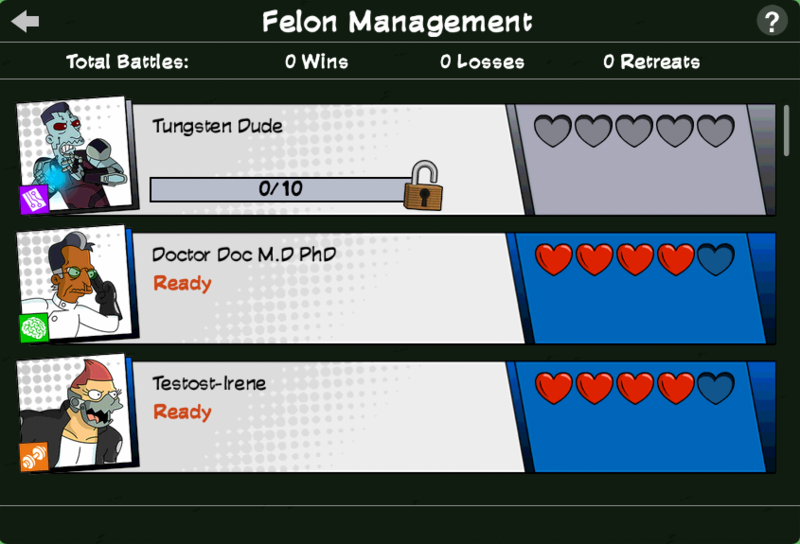 was added to the Felon Battles. After completing Claw and Order Pt. 7, Criminals now walk like crabs. 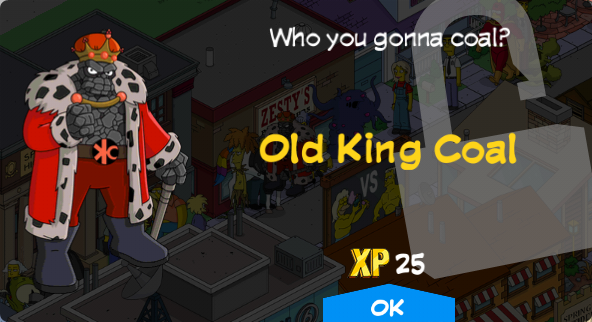 After unlocking Old King Coal he's now placed on Inventory instead of being immediately unlocked. Store icon for Tar Pits w/Petroleus Rex is now centered. 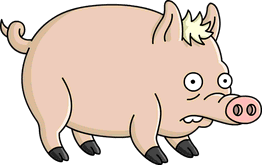 First Bank of Springfield start time was set to June 27th instead of 28th. Pharmaceuticals reward on Insanity Mode has returned and is now permanent. It requires the user to not have more than 200. One Week Wonder Films: from 115 to 77. 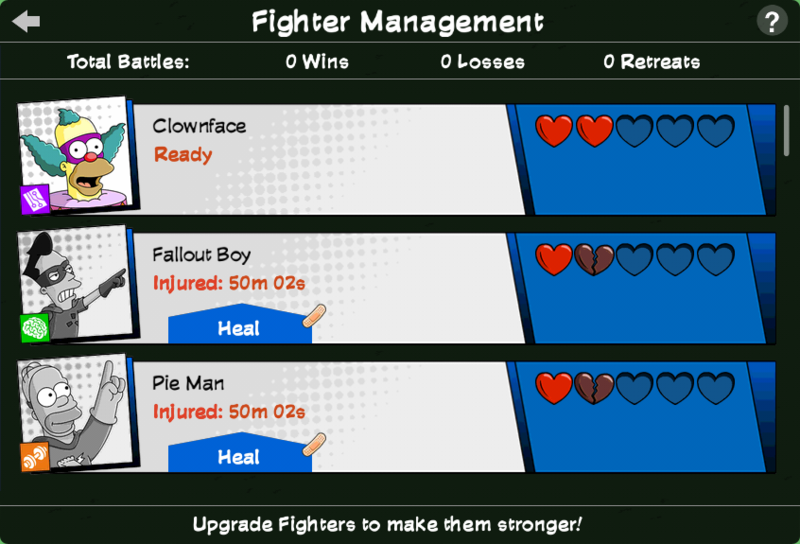 Fighters' description was changed removing "Felons". Superheroes 2's Lay Low's times was changed from 24 hours to 4 hours. 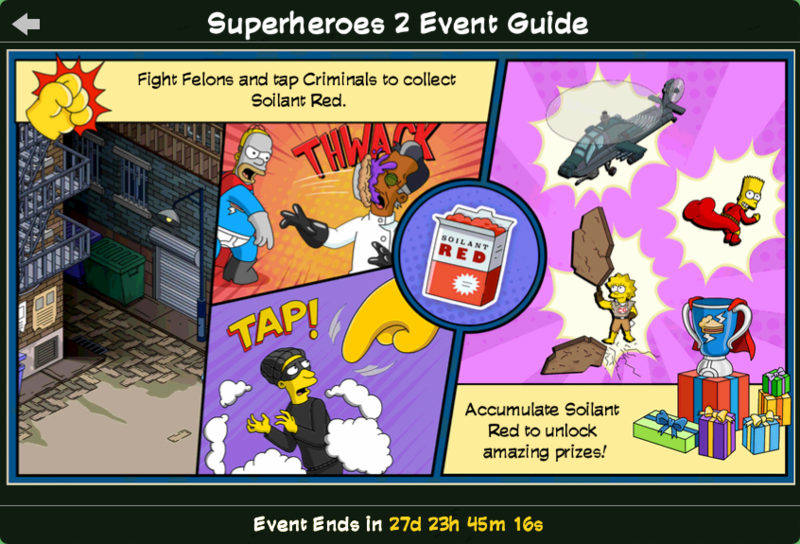 Superheroes 2's Train Harder than Ever, Infiltrate the Soilant Red Factory and Check Out Mylar Baggins's times were changed from 8 hours to 4 hours. Superheroes 2's Eat Algae, Sabotage the Security System and Protest the Lack of Lasers's times were changed from 12 hours to 4 hours. 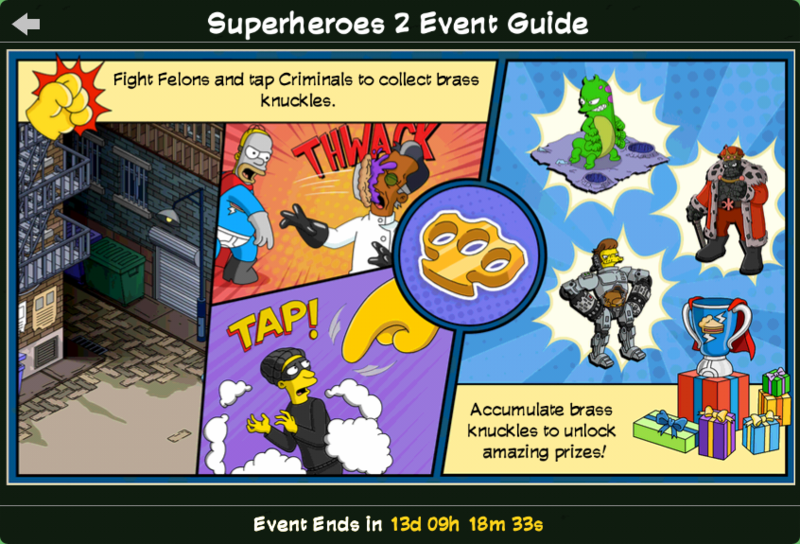 Free rush once the job is almost over for multiple character tasks taking Donuts rushing another character instead of the finishing one was fixed. It affect the following Superheroes 2 jobs: Lay Low, Apply for Jobs, Vote on the Registration Act, Train Harder than Ever, Eat Algae, Sneak Crab Juice Into Food, Sabotage the Squishee Machine, Tamper With All the Food, Sabotage the Security System, Infiltrate the Soilant Red Factory, Binge on Lobster Meat, Protest the Lack of Lasers, Listen Intently and Check Out Mylar Baggins. 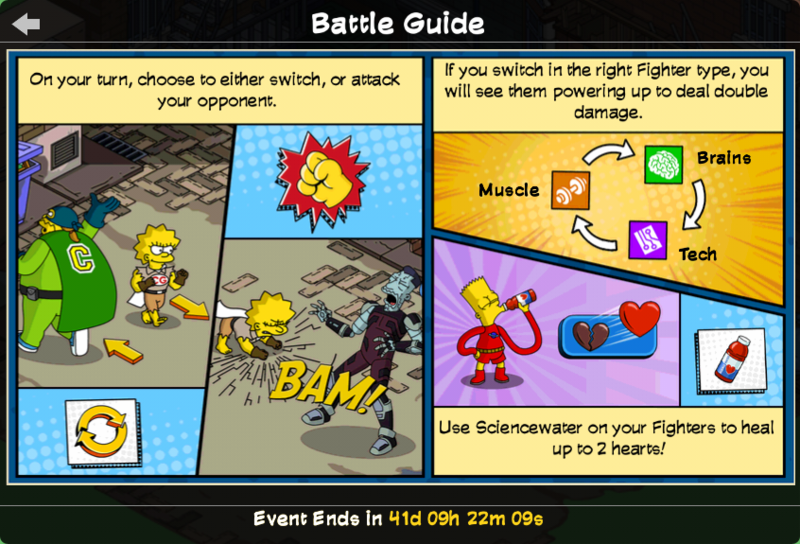 Quick Battles System Message was changed from "Important tip: The quick battle button will fast forward time but won't make strategic decisions along the way." to "Important tip: In a quick battle Fighters will attack each other until one team is defeated, no switches or heals will be used." 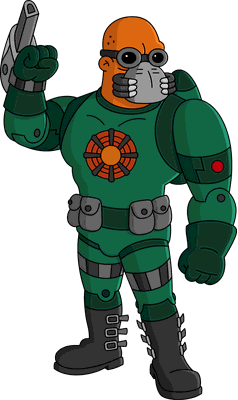 Claw & Order Pt. 4's Make Youngsters Ignore the Curfew now requires only 1 youngster to do the job instead of 5. Quick Battles were enabled instead of the previous set start day, July 3rd. Added a description for Death Mountain and Dr. Colossus combo: "Brain Fighters use their noodles to deal double damage against Tech.". 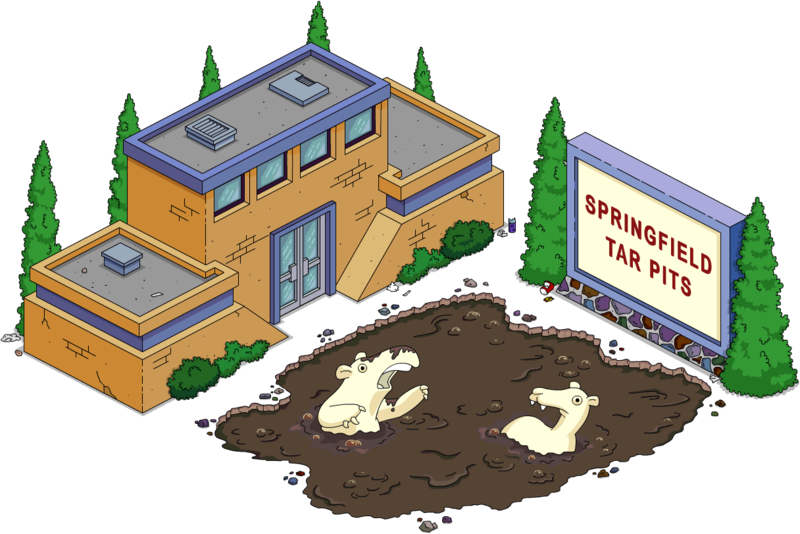 Springfield National Park with Teddy Roosevelt offer was changed to end on July 8th at 7am GMT. 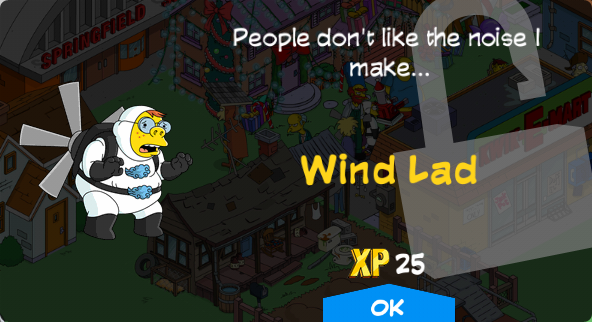 Fixed a bug with the 4th of July and Duff Garden offers not showing up in the store after decling it. 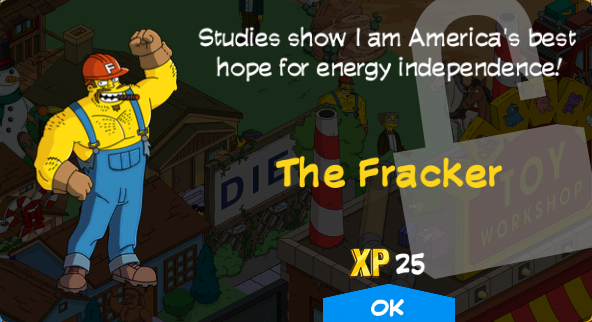 Completing 4th of July character group now yields the correct amount of $ and XP and is now scrolling. 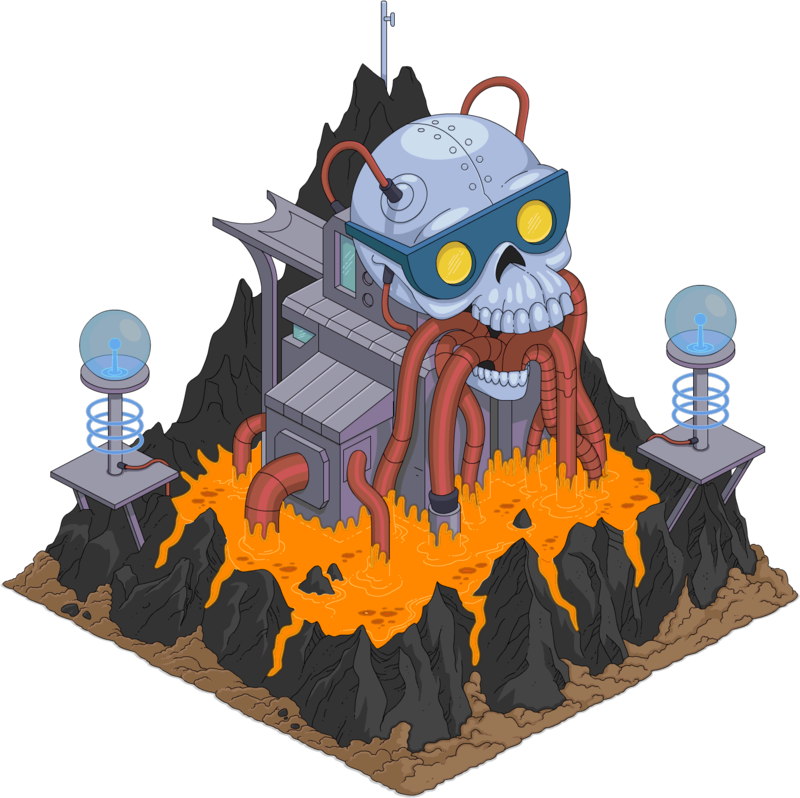 Death Mountain was set to be also buyable alone without Dr. Colossus if the user has Dr. Colossus. 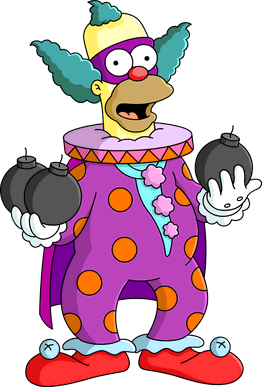 Clownface's jobs Check Krusty Brand Merchandise and Plan a Convoluted Heist don't require Clownface Rises to be started anymore. 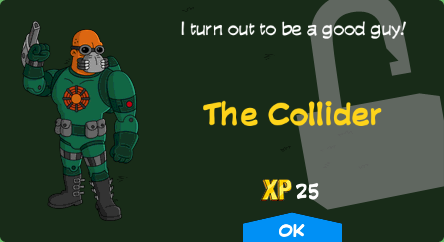 The Collider's job Die and Come Back in the Credits doesn't require The Collider Pt. 4 to be started anymore. 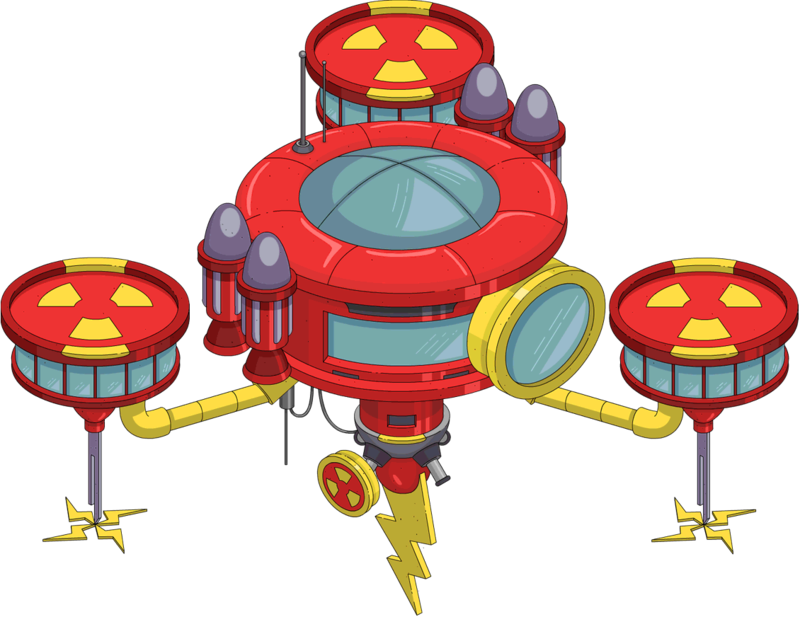 The Collider's job Pet Mr. Boson doesn't require The Collider Pt. 2 to be started anymore. 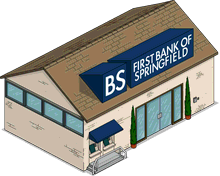 The quest National Bank of Springfield doesn't require Clownface Rises to be started anymore. 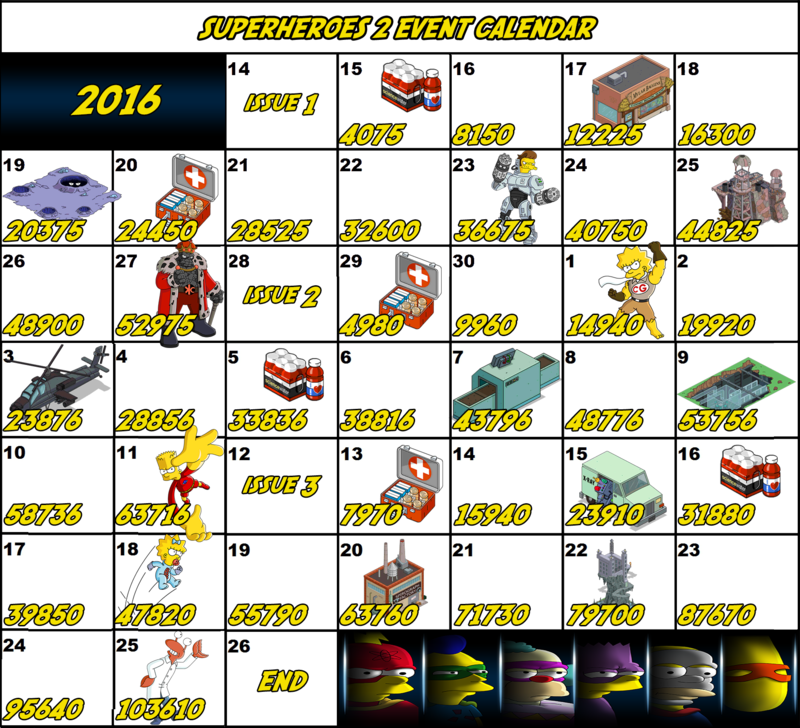 Superheroes 2 and 4th of July 2016 one panel positions were switched. 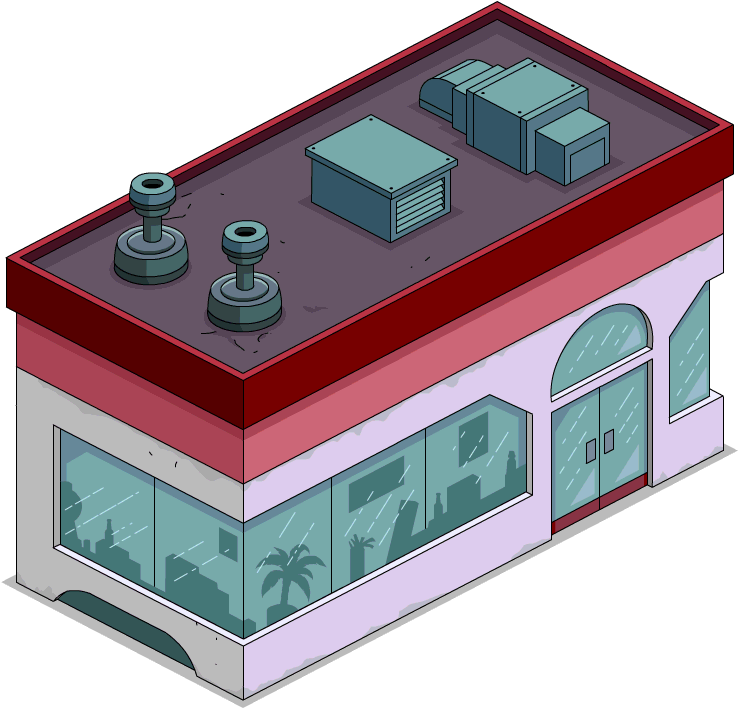 The glitch where characters that can be sent to special buildings like Open Air Stage, Town Plaza, etc. can be sent on other tasks too was fixed. 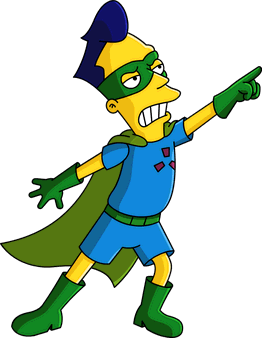 Instead of July 12th, Radioactive Man, Kane Manor, Bartman and Bartman Cave returns on July 8th and Radstation Air Fortress returns on July 10th. 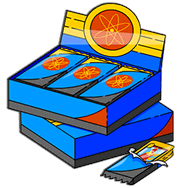 Instead of showing just Radioactive Man icon, the offer that includes Radioactive Man, Kane Manor, Bartman and Bartman Cave in one package now shows the proper offer one. Bouncing Battle Baby: from 46.150 to 45.000. Spirography Factory: from 60.800 to 61.900. 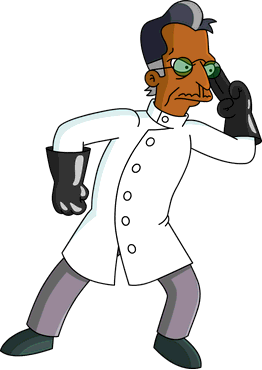 Dr. Lenny's Lab: from 78.850 to 78.800. 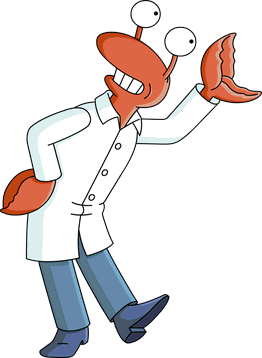 Dr. Crab: from 101.400 to 103.600. 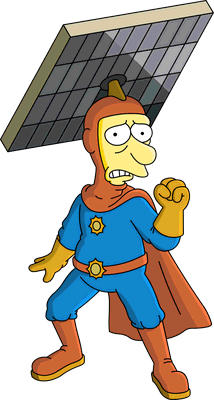 The unreleased Radioactive Man Movie Set was set to appear in a Gil Promo on July 20th. In Claws Combat Pt. 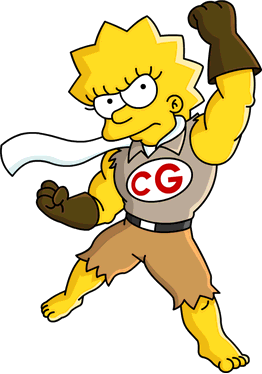 3, Lisa's emotion changed from curious to confused. In Claws Combat Pt. 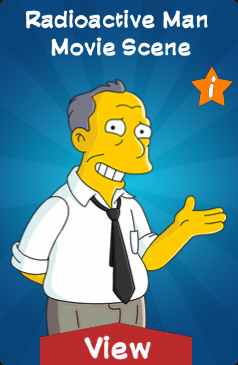 6, Lisa saying "Wow dad, you're taking responsibility..." was changed to "Wow Dad, you're taking responsibility...". 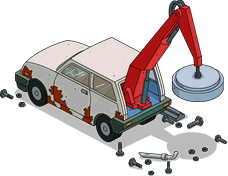 The name of Dr. Crab's Factory - Destroyed was changed to Soilant Red Factory Destroyed. 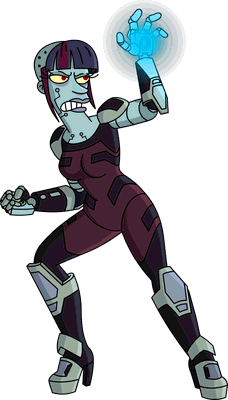 A description was added to the Death Mountain and Dr. Colossus combo: "Brain Fighters use their noodles to deal double damage against Tech.". 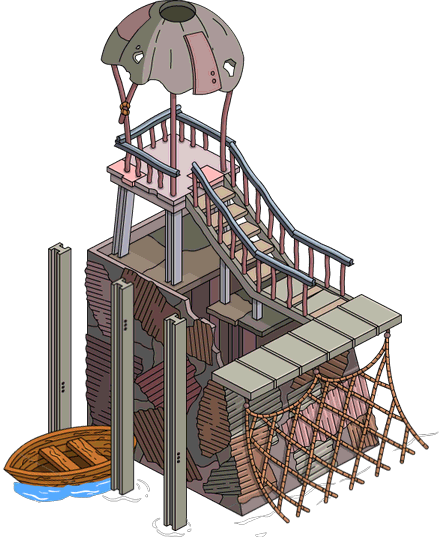 The Squidport Boardwalk Tiles limit in inventory of 400 was removed, together with the glitched non-working tiles if a user had more than 400 stored. 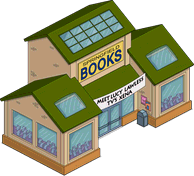 A possible glitch in the Coffee Shop in Springfield Heights regarding Louie's job was fixed. Limited time timer for items set to end on July 30th at 7am GMT, was set to finish on July 26th at 7am GMT, end of the event. 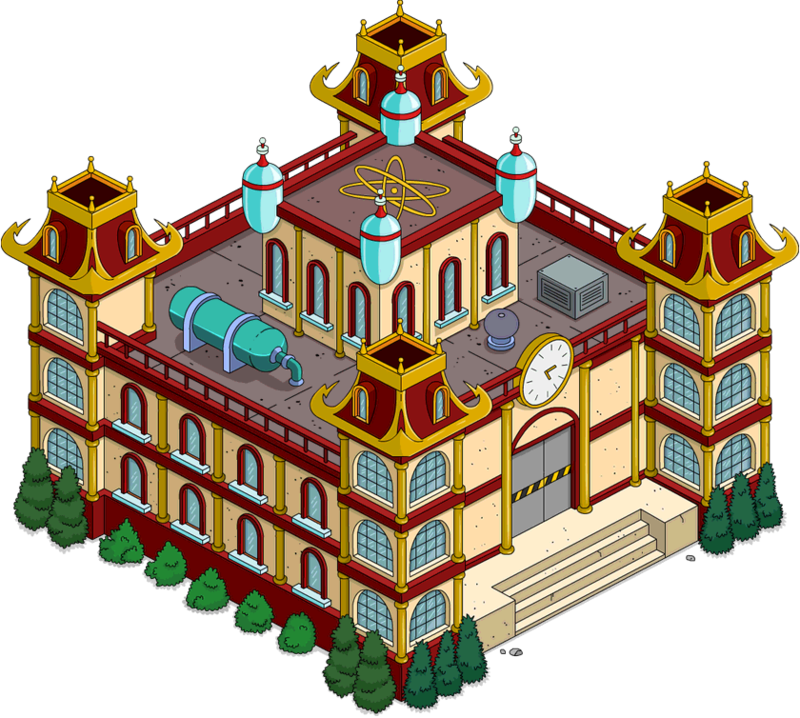 Wolfcastle's Mansion can now be bought in Early Access for the duration of the Radioactive Man Movie Set promo. 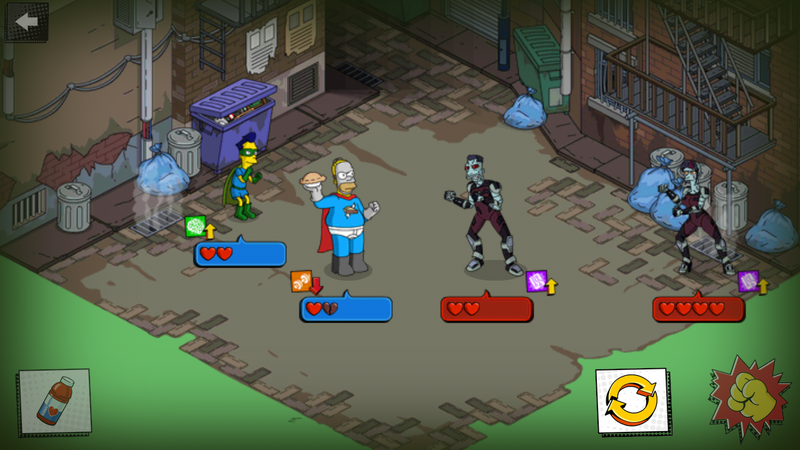 Character icons were added for the Boss Fight. 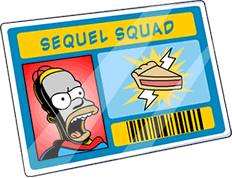 Sequel Squad Membership cost was changed from 90 to 30. 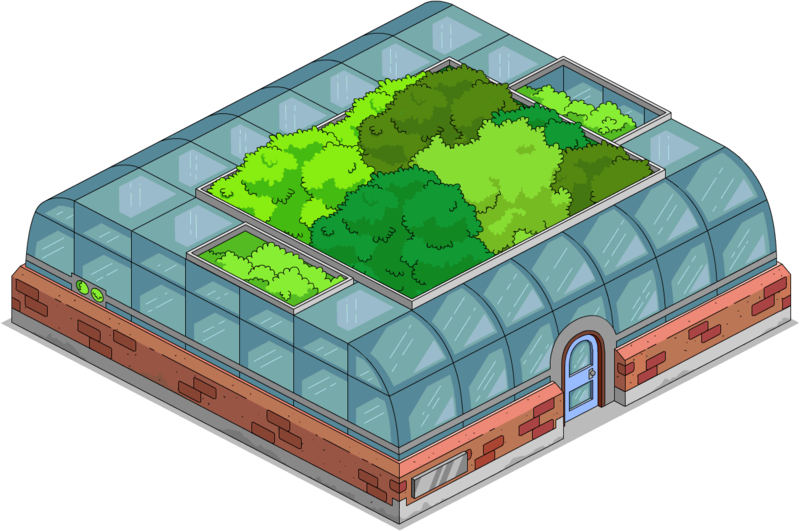 Botanical Garden can't be crafted if not placed anymore, fixing the possibility of crafting it if in inventory. Platinum Scratch-R second chance now ends on July 26th instead of July 27th. Stretch Dude's job Hop Around with Clobber Girl was removed, probably till fixed. 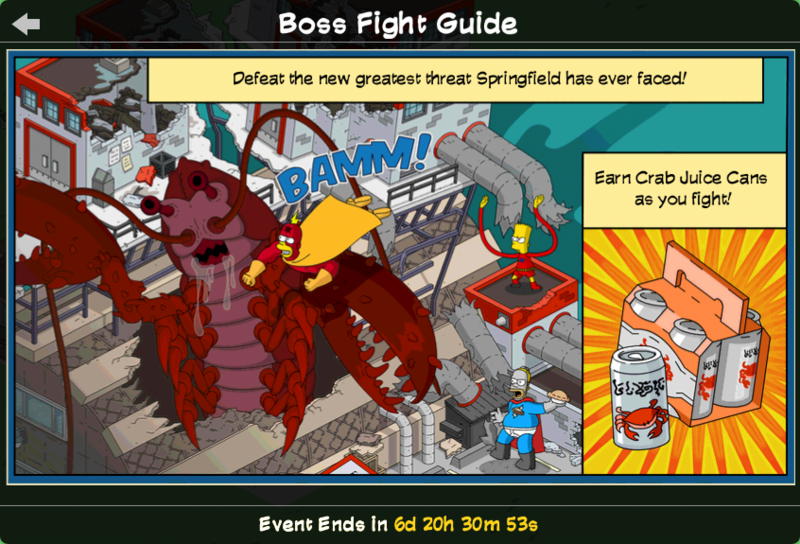 If the boss is tapped now the screen shakes. 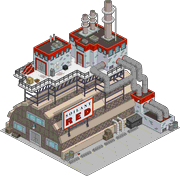 Soilant Red Factory getting to the final stage is set once the quest The Dead Lobster is started instead of when it's finished. 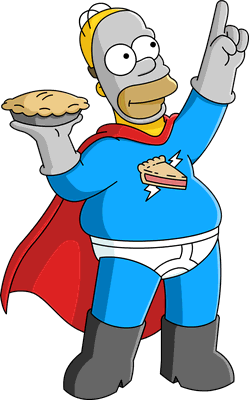 Pie Man's job Deal the Final Blow was changed from 4 hours to 8 hours. The questline Hector Von Colossus doesn't require last year's quest anymore, instead it requires Dr. Colossus to be unlocked, unlocking his stuck jobs. 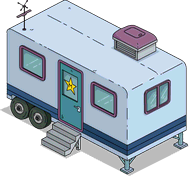 A 12 hours premium job for Milhouse at Milhouse's Trailer, Sulk About Fame, was added. 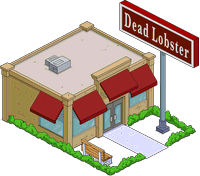 Dead Lobster now requires the building to not have been placed or in inventory too instead of just requiring the quest The Dead Lobster to be started. 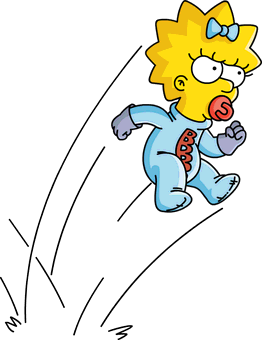 Fixed a glitched animation of Bouncing Battle Baby switching with Homer in battle, but she disappears once fighting the Boss Fight. 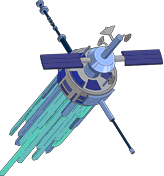 Modified on September 12, 2018, at 15:38.